Obverse description: Crowned bust facing within an inner circle, drapery of wedges that do not overlap, trifoliate crown with spearheads that reach half way up central fleur. Reverse description: Long cross pattee dividing the legend, three pellets in each angle of the cross, all within an inner circle. 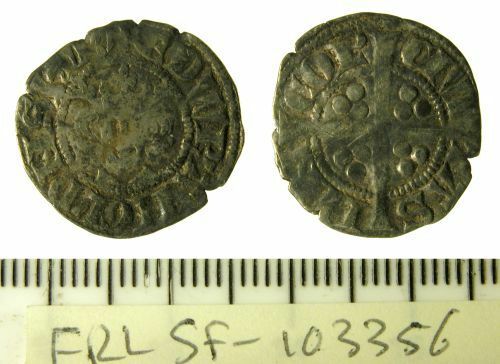 A silver Medieval penny of Edward I, class 3cd, c.1280-1281 AD. Withers and Withers, 2006: pp. 24-25. A Medieval silver penny of Edward I, class 3cd, c.1280-1281 AD. Withers and Withers, 2006: pp. 24-25.